For more than three decades, almost everyone who matters in American politics has agreed that higher taxes on the rich and increased aid to the poor have hurt economic growth. Liberals have generally viewed this as a trade-off worth making, arguing that it’s worth accepting some price in the form of lower G.D.P. to help fellow citizens in need. Conservatives, on the other hand, have advocated trickle-down economics, insisting that the best policy is to cut taxes on the rich, slash aid to the poor and count on a rising tide to raise all boats. But there’s now growing evidence for a new view — namely, that the whole premise of this debate is wrong, that there isn’t actually any trade-off between equity and inefficiency. Why? It’s true that market economies need a certain amount of inequality to function. But American inequality has become so extreme that it’s inflicting a lot of economic damage. And this, in turn, implies that redistribution — that is, taxing the rich and helping the poor — may well raise, not lower, the economy’s growth rate. You might be tempted to dismiss this notion as wishful thinking, a sort of liberal equivalent of the right-wing fantasy that cutting taxes on the rich actually increases revenue. In fact, however, there is solid evidence, coming from places like the International Monetary Fund, that high inequality is a drag on growth, and that redistribution can be good for the economy. Earlier this week, the new view about inequality and growth got a boost from Standard & Poor’s, the rating agency, which put out a report supporting the view that high inequality is a drag on growth. The agency was summarizing other people’s work, not doing research of its own, and you don’t need to take its judgment as gospel (remember its ludicrous downgrade of United States debt). What S.& P.’s imprimatur shows, however, is just how mainstream the new view of inequality has become. There is, at this point, no reason to believe that comforting the comfortable and afflicting the afflicted is good for growth, and good reason to believe the opposite. Specifically, if you look systematically at the international evidence on inequality, redistribution, and growth — which is what researchers at the I.M.F. did — you find that lower levels of inequality are associated with faster, not slower, growth. Furthermore, income redistribution at the levels typical of advanced countries (with the United States doing much less than average) is “robustly associated with higher and more durable growth.” That is, there’s no evidence that making the rich richer enriches the nation as a whole, but there’s strong evidence of benefits from making the poor less poor. But how is that possible? Doesn’t taxing the rich and helping the poor reduce the incentive to make money? Well, yes, but incentives aren’t the only thing that matters for economic growth. Opportunity is also crucial. And extreme inequality deprives many people of the opportunity to fulfill their potential. Think about it. Do talented children in low-income American families have the same chance to make use of their talent — to get the right education, to pursue the right career path — as those born higher up the ladder? Of course not. Moreover, this isn’t just unfair, it’s expensive. Extreme inequality means a waste of human resources. And government programs that reduce inequality can make the nation as a whole richer, by reducing that waste. Consider, for example, what we know about food stamps, perennially targeted by conservatives who claim that they reduce the incentive to work. The historical evidence does indeed suggest that making food stamps available somewhat reduces work effort, especially by single mothers. But it also suggests that Americans who had access to food stamps when they were children grew up to be healthier and more productive than those who didn’t,which means that they made a bigger economic contribution. The purpose of the food stamp program was to reduce misery, but it’s a good guess that the program was also good for American economic growth. The same thing, I’d argue, will end up being true of Obamacare. Subsidized insurance will induce some people to reduce the number of hours they work, but it will also mean higher productivity from Americans who are finally getting the health care they need, not to mention making better use of their skills because they can change jobs without the fear of losing coverage. Over all, health reform will probably make us richer as well as more secure. Will the new view of inequality change our political debate? It should. Being nice to the wealthy and cruel to the poor is not, it turns out, the key to economic growth. On the contrary, making our economy fairer would also make it richer. Goodbye, trickle-down; hello, trickle-up. 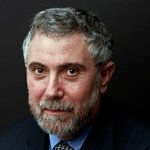 This entry was posted in Business, Economics and tagged Paul Krugman, United States by FabioPisiVitagliano. Bookmark the permalink.